for halloween, people dress up their kids, themselves and even their pets. at , we dress up our cars. 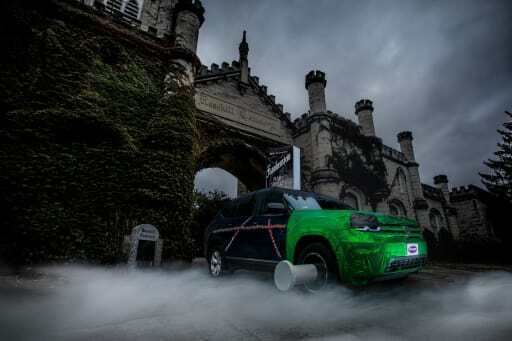 in 2016, we dressed up our volvo xc90 as world series-winning chicago cubs manager joe maddon, followed in 2017 by the coolest scary clown, the joker, via the "the dark knight." 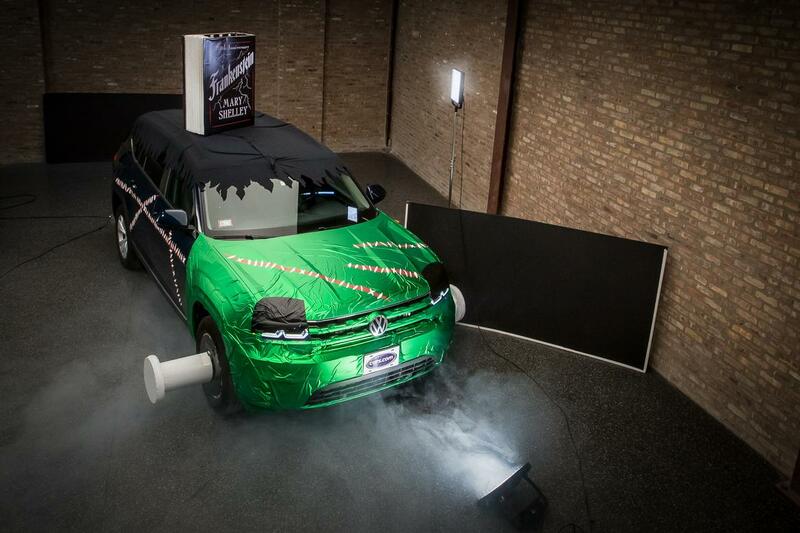 to follow those two tough acts on our third annual trunk-or-treat car-stume for 's best of 2018-winning long-term volkswagen atlas test car, we resurrected an icon of the horror genre — in hopes of inspiring not only fear, but also family fun and safety awareness. this time out, we took our cultural cues from mary shelley's classic of gothic horror literature, "frankenstein," which this year marks its 200th anniversary — it's boo!-centennial, if you will. while most people may be familiar with boris karloff's version of everyone's favorite flat-topped, bolt-necked, reanimated corpse from the 1931 film (or perhaps you prefer your frankenstein's monster with a new york accent a la robert de niro in the 1994 version? ), some of you young whippersnappers may be surprised to learn there was a book that came out first. it was authored by young english novelist mary shelley and released in january 1818, titled "frankenstein; or, the modern prometheus" — and it made liberal use of the word "countenance" (but i digress). you could consider ol' frankenstein to be the o.g. zombie of both literature and hollywood, and with the popularity of "the walking dead" and "world war z" in recent years, the zombie zeitgeist of the past decade refuses to die. another trend continuing to pick up scream in recent years is families' and communities' participation in so-called trunk-or-treat events. trunk-or-treating was originally conceived as a safer alternative to turning kids loose on the streets at night to take candy from strangers. instead, parents, neighbors, schools and churches designate a time for folks to gather in a large open space — such as a parking lot or field — and dress their vehicles in themed halloween costumes, then let the kids go from parked car to parked car collecting candy in a safe, controlled environment. meanwhile, the adults can socialize while they supervise. why all the hubbub over halloween? because while all hallows' eve is generally considered a night for youngsters to have some spooky fun and maybe even cause a bit of victimless mischief, it has also traditionally been the deadliest day of the year for child pedestrians. according to an analysis by stats-crunching website sperling's bestplaces and insurance provider state farm, in the 21 years from 1990 to 2010, child pedestrian fatalities on oct. 31 more than doubled the daily average for the rest of the year. an earlier study by the centers for disease control and prevention covering two decades showed child pedestrian deaths on halloween between the hours of 4 p.m. and 10 p.m. quadrupled. 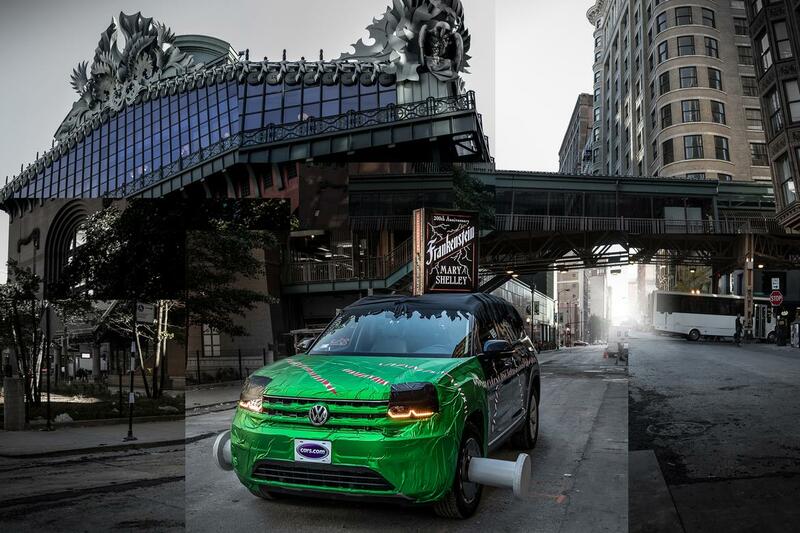 first, we applied a green vinyl wrap, intended for automotive use, to the front end of our vw atlas. we then cut long strips of red vinyl for the scars and small strips of white vinyl for the stitches, and applied those to the sides and hood. we pieced together black fabric and trimmed it to create our creature's coiffure, and applied black vinyl to make hooded eyelids. frankie's neck bolts were fashioned from styrofoam circles affixed to cardboard rings, then painted and attached to the atlas' front wheels using aluminum pop cans. the car-stume-topping tome is made from cardboard and covered by a professionally printed book, with trimmed styrofoam strips glued together for the book pages. the whole thing took six of us about six hours to assemble at a total cost of around $290. watch the time-lapse video above to see our franken-car's progression from inanimate object to "it's aliiiiive!"